SharedGeo is pleased to announce that the locally developed, geospatial open source program, GeoMOOSE, was recently recognized with a Commendation from Minnesota’s Governor, Mark Dayton. 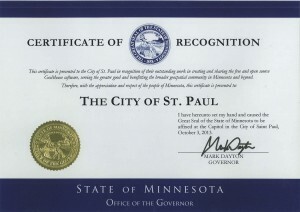 The award was presented to the City of St. Paul for its role in the creation and release of GeoMoose as an open source project. Administered by the Minnesota Geospatial Information Office (MnGeo), the Governor’s Award honors a project or organization that “exemplifies a commitment to coordinated, affordable, reliable and effective use of GIS to improve services within Minnesota” by improving government responsiveness, promoting public access to information, and fostering and exemplifying the benefits of collaboration. The first version of GeoMOOSE was developed by SharedGeo Technical Director, Bob Basques, SharedGeo chief programmer, James Klassen, and Dan Little, of D.B. Spatial, while they were employed by the city of St. Paul. GeoMOOSE joins Mapserver as one of only two open source programs honored with the Minnesota Governor’s Geospatial Commendation Award. Earlier this year, GeoMOOSE also joined Mapserver as one of only two open source programs with Minnesota origins to be officially sanctioned by the Open Source Geospatial Foundation (OSGeo). As an open source software, GeoMOOSE is available at no-cost to any organization that would like to serve spatial data publicly. You can learn more about GeoMOOSE and the Minnesota Governor’s Geospatial Commendation Award by visiting the GeoMOOSE and MnGeo websites.